10 Things You Might Not Know About STAR TREK | Warped Factor - Words in the Key of Geek. On the 50th anniversary of Star Trek's television debut, Geek Dave boldly goes back to the beginning. 1. 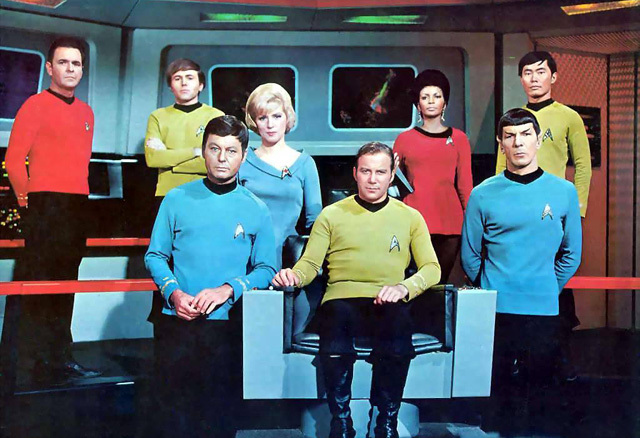 Although Star Trek debuted on NBC, September 8th 1966, the story began over two years earlier when, on March 11th 1964, Gene Roddenberry, a long-time fan of science fiction, drafted a short treatment for a science-fiction television series. He proposed that the series would be set on board a large interstellar spaceship in the 23rd century, with a crew dedicated to exploring a relatively small portion of our galaxy, the Milky Way. Roddenberry had extensive experience in writing for Wild West television series', and so armed with this background his first draft deliberately characterised the new show as "Wagon Train to the stars." Each episode was to be a self-contained adventure story, set within the overarching structure of a continuing journey, rather than being bound to the same location. The following month, Roddenberry presented the Star Trek draft to Desilu Productions, meeting with Herb Solow, Desilu's Director of Production. Solow saw promise in the idea and signed a three-year program-development contract with Roddenberry. In May 1964, Solow, who previously worked at NBC, met with Grant Tinker, then head of the network's West Coast programming department. Tinker commissioned a pilot episode, so over the next six months the idea was extensively revised and fleshed out until NBC deemed a script suitable to go before the cameras. 2. The first Star Trek pilot, titled The Cage, was shot from November 27th to mid-December 1964, with post-production work (pick-up shots, editing, scoring, special photographic and sound effects) continuing to January 18th 1965. Much of Roddenberry's original treatment was included in The Cage, although he had proposed it would feature Captain Robert April of the starship S.S. Yorktown. This character was developed into Captain Christopher Pike, and the S.S. Yorktown became the USS Enterprise. The man set to star in the series as the lead protagonist was Jeffrey Hunter, who was given a six-month exclusive option for the role of Captain Pike if the pilot was picked up by the network. It was not! NBC passed feeling that it was "too cerebral," "too intellectual," and "too slow" with "not enough action." However, the NBC executives were still impressed with the concept, and they understood that its perceived faults had been partly because of the script that they had selected themselves, so made the unusual decision to pay for a second pilot, using a script called Where No Man Has Gone Before. "I am told you have decided not to go ahead with Star Trek. This has to be your own decision, of course, and I must respect it. You may be certain I hold no grudge or ill feelings and expect to continue to reflect publicly and privately the high regard I learned for you during the production of our pilot." Two weeks after the option expired on June 1st 1965, Hunter formally gave his letter requesting separation from the project. He died in 1969. 3. Only two of the actors seen in The Cage were carried forward to the series. They were Leonard Nimoy and Majel Barrett, and neither of them were popular with the network! Nimoy, of course, played the character of Mr. Spock, who had delivered the first line in all of Star Trek: "Check the circuit!" followed by, "Can't be the screen then." In The Cage, the character had differed somewhat from that seen in the rest of Star Trek as Spock had displayed a youthful eagerness that contrasted with the later more reserved and logical character we all know. NBC were also very worried about Leonard Nimoy's "satanic" appearance and pressured for his removal from the second pilot. Roddenberry, however, stood firm. 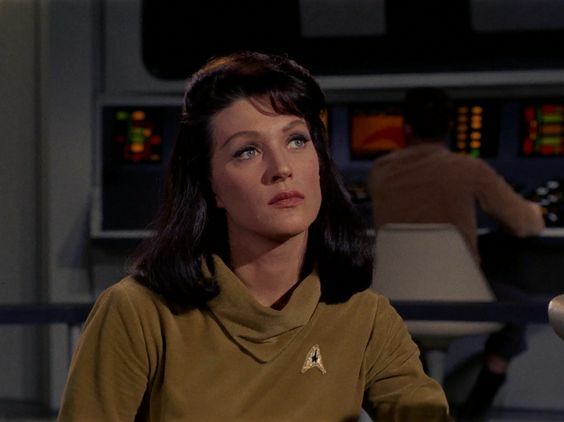 Majel Barrett had played the USS Enterprise's brunette unnamed first officer, "Number One". Barrett was romantically involved with Roddenberry, whose marriage was on the verge of failing at the time, indeed the two would marry in 1969. But in 1965, the idea of having an otherwise unknown woman in a leading role just because she was the producer's girlfriend is said to have infuriated NBC network executives who insisted that Roddenberry give the role to a man. William Shatner corroborated this in his Star Trek Memories book, and added that female viewers at test screenings hated the character as well, commenting that she was "pushy" and "annoying" and also thought that "Number One shouldn't be trying so hard to fit in with the men." Barrett often joked that Roddenberry, given the choice between keeping Mr. Spock or the woman character, "kept the Vulcan and married the woman, because he didn't think Leonard would have it the other way around." Her role in subsequent episodes of Star Trek was altered to that of blonde Nurse Christine Chapel, a frequently recurring character, known for her unrequited affection for the dispassionate Spock. 4. 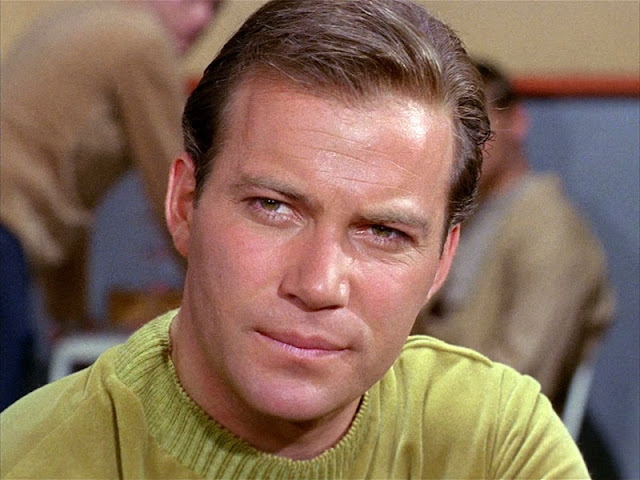 Whilst developing the new pilot episode, Where No Man Has Gone Before, Roddenberry changed the captain's name to James Kirk after rejecting other options like Hannibal, Timber, Flagg and Raintree. The name was inspired by Captain James Cook, whose journal entry "ambition leads me ... farther than any other man has been before me" inspired the episode title. With Hunter ruling himself out of the part the search was on for a new lead actor. Lloyd Bridges was considered for the role, but future Hawaii Five-O star Jack Lord emerged as Desilu Productions' prefered choice to play Kirk. However, his demand for fifty-percent ownership of the show led to him not being hired, leaving the door open for a certain William Shatner. 5. 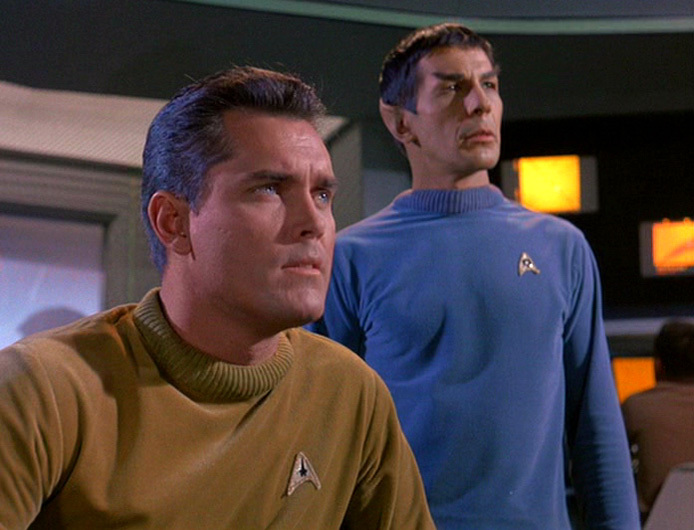 Apart from Captain Kirk, the second pilot introduced two other regular characters to the show: James Doohan as Chief Engineer Montgomery Scott (the name chosen after Doohan had tried various accents, and had decided that an engineer ought to be Scottish) and George Takei as Ship's Physicist Sulu, who would become the helmsman in the regular series. When developing the ship's doctor Roddenberry had always had DeForest Kelley in mind, who he had worked with on previous non-Trek television pilots. However, for the first rejected pilot Roddenberry went with director Robert Butler's choice of John Hoyt to play Dr. Philip Boyce, and for the second pilot Roddenberry accepted director James Goldstone's decision to have Paul Fix play Dr. Mark Piper. Some years later Roddenberry would claim that NBC had initially rejected Kelley to play the character of ship's doctor in the second pilot, but the truth was Roddenberry had just not put Kelley's name forward to the network until after Star Trek was picked up for series. 6. Filming began on Where No Man Has Gone Before on July 19th 1965, and continued for nine days until July 28th. The episode cost around $300,000, which was less than half the money spent on The Cage. This was mainly down to the fact that the majority of costumes and the Enterprise sets could be reused, indeed the only major new set constructed for the episode was the Enterprise's Sickbay. During filming, a wasp's nest high in the rafters of the studio was somehow disturbed, and many cast and crew members suffered stings as a result. As this happened on a Friday, the weekend break allowed time for the swelling to go down; Shatner, however, required additional makeup to hide the stings during shooting the following Monday. 7. 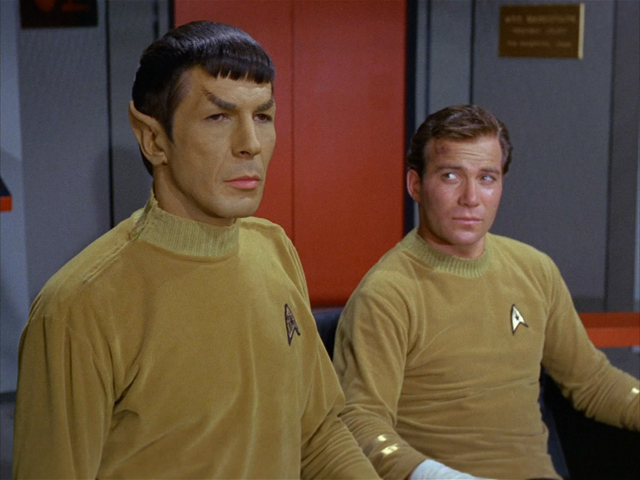 Post-production on Where No Man Has Gone Before was delayed by Roddenberry's involvement in another pilot, Police Story, but eventually finished in January 1966 when the episode was presented to NBC for approval. Which finally came in February 1966. Roddenberry later joked that, as with the first pilot, this one still had a lot of science-fiction elements in it which the network weren't overly keen on, but ending it with Kirk in a bare knuckle fistfight with Lt. Commander Gary Mitchell is what sold NBC on Star Trek. 8. 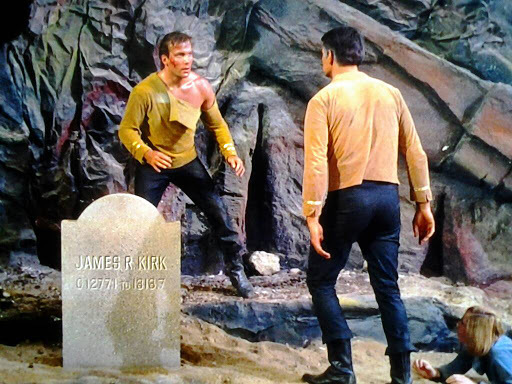 Kirk's middle initial is given as R. in Where No Man Has Gone Before and is seen clearly on the gravestone fashioned by Mitchell for Kirk. Subsequent episodes use James T. Kirk, with the middle name first revealed to be Tiberius in an episode of Star Trek: The Animated Series called Bem. 9. Missing from The Cage, Where No Man Has Gone Before contains the first use of the Star Date concept, as used in the voice over narration (it's 1312.4). This was incorporated into the script by Roddenberry on the suggestion of Herb Solow. 10. Where No Man Has Gone Before would eventually be broadcast as the third episode of Star Trek, on September 22nd 1966, following Charlie X and the opening episode The Man Trap (which was actually the sixth episode shot) which placed first in its timeslot on September 8th 1966. But the version of Where No Man Has Gone Before that aired differed from the one presented to NBC for approval, including a different intro and credits. It also featured a much longer opening narration by Shatner. In some places alternate musical scores were used. In total almost 5 minutes of additional footage was removed to accommodate the 50-minute network broadcast format, allowing for commercials. 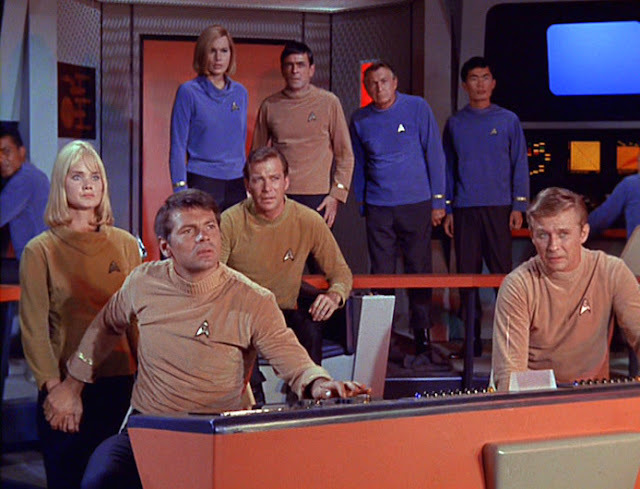 The pilot episode in, what would become known as, its original "alternate" version was known to the public before the aired version, having been shown at the 24th Worldcon in Cleveland, Ohio, on September 3rd 1966 (before the premiere broadcast of Star Trek on NBC), where it received a standing ovation. The studio did not retain a print of the original "alternate" version, and it was officially thought to be lost, though many fans knew that it existed somewhere as it had occasionally turned up on poor quality VHS tapes at conventions. 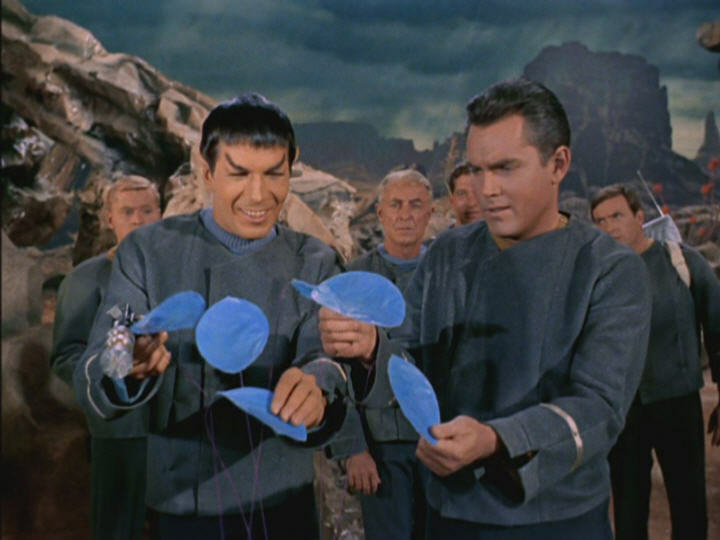 It wasn't until 2009 when a German film collector discovered a print of it and brought it to the attention of CBS/Paramount that it finally became available to the public, released as part of the Star Trek Season 3 Box Set on Blu-ray under the title Where No Fan Has Gone Before – The Restored, Unaired Alternate Pilot Episode.